Whose Spent More on War? Bush, Obama, or Trump? The War on Terror is a military campaign launched by the President George W. Bush in response to the al-Qaida 9/11 terrorist attacks. The War on Terror includes the Afghanistan War and the War in Iraq. It added $2.4 trillion to the debt as of the FY 2020 budget. 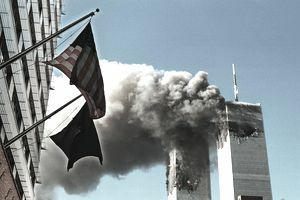 President Bush announced the War on Terror on September 20, 2001, in a speech to Congress. "Our war on terror begins with al-Qaida," he said, "but it does not end there. It will not end until every terrorist group of global reach has been found, stopped, and defeated." Spending for the War on Terror includes three major components. First, is spending for Overseas Contingency Operations. Congress appropriates these emergency funds, and they aren't subject to budget limits such as sequestration. Second are the significant increases in the base budget for the Department of Defense. Third are the additions to the Department of Veterans Affairs budget to treat wounded soldiers. Spending rises along with the number of boots on the ground for these two wars. It also beefs up the domestic force that supports foreign operations. It develops new technology, such as the F-35 fighter jet and drones. The U.S. military budget includes the DoD and VA base budgets and the OCO. It also includes supporting departments, such as Homeland Security, State Department, and the National Nuclear Security Administration. Here is the War on Terror costs by budgetary years. Defense and War on Terror OCO costs are from the "National Defense Budget Estimates for FY 2019," Table 2-1, April 2018, unless otherwise noted. VA spending is from each annual budget from the Office of Management and Budget. FY 2001 – $31 billion: Congress appropriated $22.9 billion in emergency funding for the War in Afghanistan. The United States attacked the Taliban for hiding al-Qaida's leader, Osama bin Laden. The Taliban lost power in December 2001. Hamid Karzai became interim administration head. That same month, ground troops pursued bin Laden into the Afghan foothills. He escaped to Pakistan on December 16, 2001. FY 2002 – $59.1 billion: Bush shifted his focus from bin Laden to gain congressional approval for the Iraq War. He had received intelligence in October 2002 that its leader, Saddam Hussein, was building weapons of mass destruction. For more on Iraq's role in the region, see Sunni-Shiite Split. In November, Congress passed the Homeland Security Act. It created a stand-alone, cabinet-level department to coordinate terrorism intelligence. It unified 22 agencies that handled domestic security. FY 2003 – $111.9 billion: Homeland Security officially opened its doors in March. The United States launched the Iraq War on March 19 with the military strategy "shock and awe." The Hussein regime fell in April. The new goal in Afghanistan was to end U.S. involvement and turn it over to NATO's peacekeeping mission. NATO added 65,000 troops from 42 countries. FY 2004 – $105.0 billion: The War in Iraq escalated to control insurgents. Photos revealed torture at the Abu Ghraib prison. That fueled more local resistance. Afghanistan created a Constitution while bin Laden threatened another terrorist attack. The United States announced an end of major combat in both wars. FY 2005 – $102.3 billion: The U.S. military protected Afghans from Taliban attacks for their first free election. Iraq voted on a new constitution and parliament. FY 2006 – $127.0 billion: The new Afghanistan government struggled to provide basic services, including police protection. Violence increased. The United States criticized NATO for not providing more soldiers. In Iraq, U.S. troops quietly executed Saddam Hussein. FY 2007 – $192.5 billion: A surge of 20,000 extra U.S. troops flew to Iraq to keep the peace until the United States-backed Shiite leaders could gain better control. FY 2009 – $197.1 billion: President Obama took office. He sent 17,000 more troops to Afghanistan in April. He promised to send another 30,000 in December. He focused on attacking resurgent Taliban and al-Qaida forces on the border with Pakistan. That added $59.5 billion to Bush's FY 2009 budget. Voters reelected Karzai amidst accusations of fraud. Obama announced he would draw down troops in 2011. Iraq forces regained control of Baghdad's Green Zone. FY 2010 – $181.0 billion: Obama funded an orderly wind-down of U.S. troops in Iraq by 2011. Surge forces went to Afghanistan. NATO agreed to turn over all defense to Afghan forces by 2014. FY 2011 – $162.4 billion: Special Forces took out Osama bin Laden on May 1, 2011. Obama announced he would withdraw 10,000 troops from Afghanistan by the end of the year, and 23,000 by the end of 2012. OCO costs rose to $158.8 billion. Troops left Iraq by December. FY 2012 – $119.6 billion: Obama announced the withdrawal of another 23,000 troops from Afghanistan in the summer, leaving 70,000 troops remaining. Both sides agreed to hasten U.S. troop withdrawal to 2013. Their presence had become unwelcome. U.S. contractors stayed in Iraq to protect American interests. FY 2013 – $49.6 billion: U.S. forces shifted to training and support role. Taliban and United States reignited peace negotiations, causing Karzai to suspend his negotiations with the United States. $82.5 $1.5 $2.8 $86.8 n.a. $88.1 $51.3 $2.9 $142.3 n.a. *Boots on Ground is the number of troops in Iraq and Afghanistan. From 2001 - 2013, it's as of December of that year. For 2014 - 2016, it's from the closest quarter. From "Department of Defense Contractor and Troop Levels in Iraq and Afghanistan: 2007-2017," Tables 3 and 4, Heidi M. Peters, Congressional Research Service, April 28, 2017.
Who Spent More -- Bush, Obama, or Trump? President Bush is responsible for the budgets from FY 2002 - FY 2009. He also added $31 billion for the War on Terror to President Clinton's FY 2001 budget. The total for those nine years is $1.16 trillion. President Obama campaigned on defense reduction. He even dropped the phrase "War on Terror." He received the Nobel Peace Prize for pulling troops out of Iraq in 2011. But his spending on the Iraq and Afghanistan wars still totaled $813 billion. That's 30 percent less than President Bush's expenditure. Spending was dictated by Bush's and Obama's economic policies. President Trump campaigned on increasing defense spending. He added $30 billion to Obama's FY 2017 budget. In FY 2018 - FY 2020, Trump will add $402.6 billion, for a total of $432.6 billion. Since 2002, the War on Terror has added $2.4 trillion, or more than 10%, to the U.S. debt. It also raises the U.S. budget deficit. Defense spending is such a big chunk of the budget that there is no realistic way to reduce either without cutting it. U.S. militarism allows other allies to cut back on their own defense spending. The War in Iraq lasted longer than the Vietnam War. More importantly, it killed 4,488 U.S. soldiers and wounded 32,226 more. Taxpayers spent more than $800 billion on the Iraq War alone. The real cost of the War on Terror is not just what it has added to the debt. It's also the lost jobs that those funds could have created. Every $1 billion spent on defense creates 8,555 jobs and adds $565 million to the economy. That same $1 billion given to you as a tax cut would have stimulated enough demand to create 10,779 jobs and put $505 million into the economy as retail spending. And $1 billion in education spending adds $1.3 billion to the economy and creates 17,687 jobs. That $2.4 trillion spent on the War on Terror created 20 million jobs and added $1.4 trillion to the economy. But if it had gone toward education instead, it would have created almost 42 million jobs. It would have added $3.1 trillion to the economy. That would have helped end the recession sooner.